Starting off the year with a bitter bang! 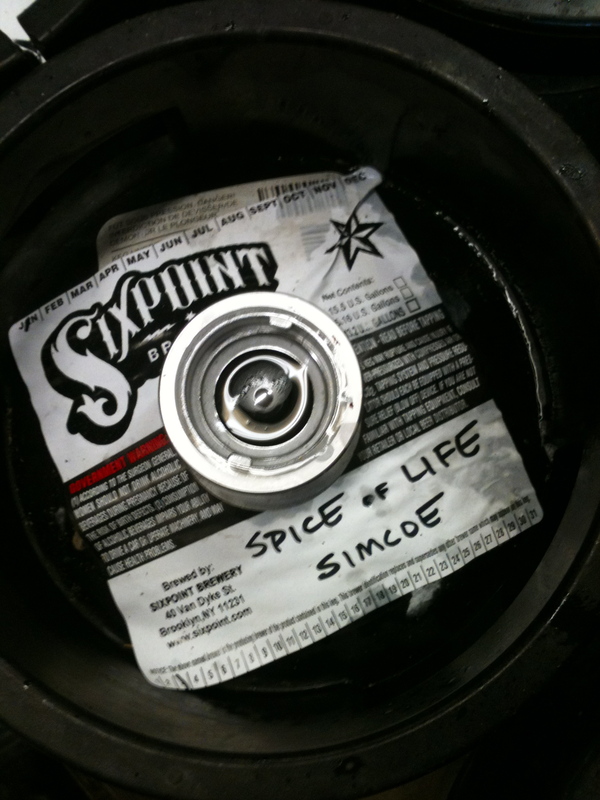 Today we kegged and shipped out our January installment of the single-hop varietal “Spice of Life” series beers. As mentioned here, this is our monthly study of unique hop strains, the stuff that makes beer taste so great, as exhibited through one stagnant pale ale recipe. Already halfway through the calendar, we come to Simcoe, a singular hop that’s gained extraordinary rise since it was introduced in 2000. If you’re a homebrewer, you’ll likely have some difficulty getting your hands on Simcoe more often than not. That’s because it’s a hop produced only by one supplier in the Yakima Valley, and sold rapidly by a few select approved distributors. Well, we’ve got you covered on tasting the stuff for the time being. Try it on draft at franny’s for the rest of the month, until February, when Nugget hops nudge their way in. There are many reasons why Simcoe is such a popular hop in the craft brewing world. It has a pine-like, but not too piney flavor; it’s refreshingly bitter, but not too bitter. Indeed, Simcoe has a low cohumulone acid level, resulting in a softer, less strident bitterness. It also has a high percentage of myrcene essential hop oils, contributing to its abundantly green, herbal aroma. (You can check out those levels for all the beers in the Spice of Life series in this nifty chart here, too.) Basically, if you’re new to hop-distinguishing in beer, or have a hard time with some of the funkier, stronger ones, then this is a really lovely hop to begin your exploration with. “One of the best, no questions asked,” said headbrewer Ian McConnell of Simcoe hops. It’s fresh out of the tanks now and ready to try!